A briefer than anticipated visit but still a few goodies on the menu. A look over No.6 tank featured a pair of Marsh Harrier over the reed beds. Also two Kestrel were hovering in the chilly easterly wind while a lone Sand Martin headed north. The first Willow Warbler and Blackcap of the year were singing loud and proud. Ducks were much reduced with just 31 Tufted Duck, 4 Gadwall and a smattering of both Eurasian Teal and Common Shelduck. The highlight was a pair of Northern Pintail that flew in, circled the bed and then flew back out again. A lone Ruff was feeding in the thick foliage of the daisy beds while a couple of Common Snipe were dozing in the sunshine. 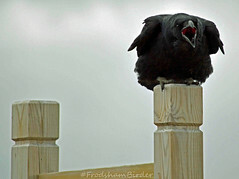 The Raven flocks again headed south with full bellies to their roost in north-east Wales.